With the mercury rising, opt to cool down at a watery oasis set in the midst of the urban jungle. Manhattanites have a dozen outdoor public pools—along with four additional "mini-pools"—to choose from, run by the New York City Department of Parks & Recreation, and best of all, they're free. 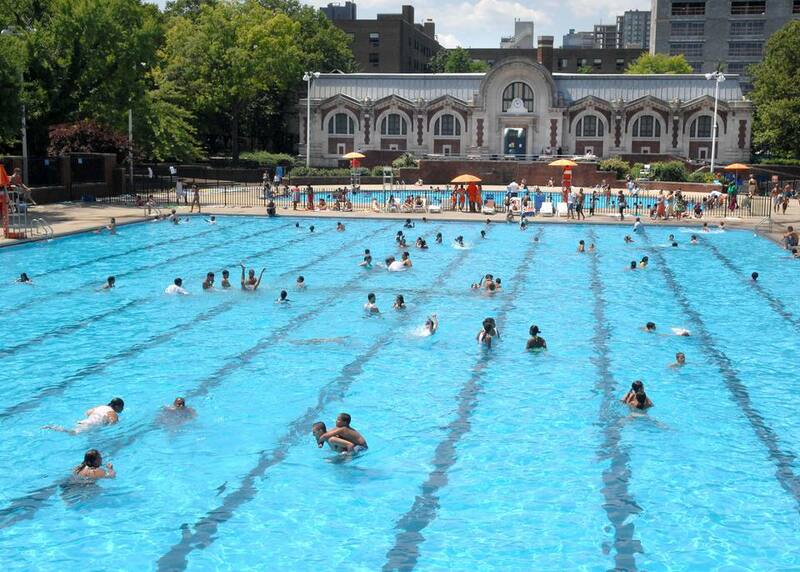 Note that NYC's outdoor public pool season runs from June 29 to September 11 in 2016 (with additional indoor pools that are open year-round); pool hours are from 11am through 7pm (though keep in mind that the pools break for a cleaning between 3pm and 4pm). Venture out to channel your inner Olympic swimmer at several Olympic-size pools (our favorite is the massive Hamilton Fish Pool on the Lower East Side), or perfect your dive at designated diving pools, like the one at John Jay Pool, set along the East River in Yorkville. Or, take a dip in the midst of Central Park, at the Lasker Rink and Pool (which transforms into a ice-skating rink every winter). The Parks Department even runs a slate of free swim classes, courtesy of their "Learn to Swim" program for both kids and adults (apply for enrollment via the online lottery system). Plus, early-bird and after-hours lap swim hours are available at certain sites. Some perfect pool day tips include bringing a combination lock to keep your belongings safe in the on-site lockers while you go for a swim (though it's an even smarter move to leave your valuables at home altogether). Note that food, glass bottles, electronic devices, and even newspapers (which tend to blow around on windy days) are not permitted at any NYC public pools. Where: 5th Ave. & E. 135th St.
Where: Asser Levy Pl. & E. 23rd St.
Where: Amsterdam Ave. btwn 100th & 102nd Sts. Where: Pitt St. & Houston St.
Where: Amsterdam Ave. & W. 173rd St.
Where: Bradhurst Ave. & W. 146th St.
Where: East of York Ave. on 77th St.
Where: 110th St. & Lenox Ave.
Where: 124th St. & Fifth Ave.
Where: W. 129th St. & Amsterdam Ave.
Where: E. 112th St. & First Ave.
Where: Ave. A btwn E. 7th & E. 10th Sts. Where: Clarkson St. & Seventh Ave. S.
Where: Thompson St. btwn Spring & Prince Sts. Where: E. 124th St. btwn First & Second Aves. These 4 Immersive Theater Experiences in NYC Break Down the "4th Wall"
Circumnavigate Manhattan and see parts of the city you've never seen before!